Kush shellfish come from the clean, Class A waters (the best possible shellfish-growing classification) of Kenmare Bay, in southwest Ireland. Our rope cultivated organic Irish mussels are deliciously juicy and sweet, with a delicate taste and a hint of saltiness. Our Pacific Oysters and periwinkles have a particular taste which is reflective of their production in a bioreserve. 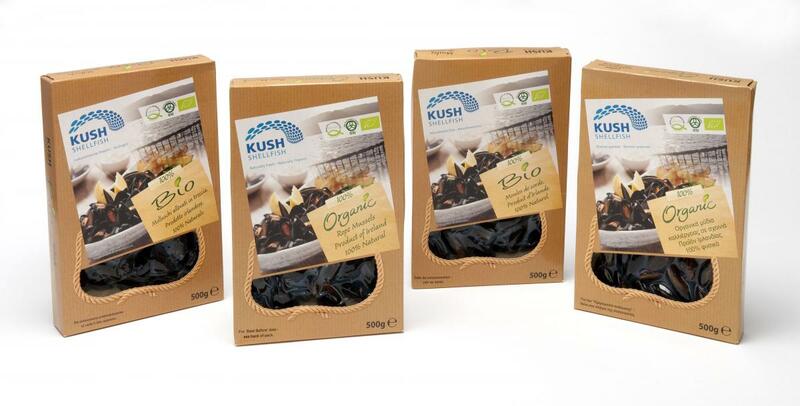 Kush Shellfish were First in the World with Pre Cooked Organic Mussels and again have developed another “First in The World “ product with its new 100% Organic Mussel Soup. A very easy way to get all your essential trace elements, packed with copper, iron, zinc, selenium and iodine in a simple delicious dish. The mussel soup only needs to be heated before eating. Click here to see images of our new product. MAP Fresh, 1kg, 1.5g, 2kg. Shelf life 10 days. Bulk Fresh, 1 tonne bag, 22kg bag (organic rope mussels). Our value added packaging can be branded as Kush Shellfish or with our distributors or retailers branding. 500g frozen. Shelf life 1 year. 500g chilled. Shelf life 28 days. 1kg frozen. Shelf life 1 year. 1 kg chilled. Shelf life 28 days. Our rope cultivated organic mussels are deliciously juicy with a delicate taste and a hint of saltiness. These quality, organic mussels can be supplied live, chilled or frozen. Our pre-packed organic rope mussels are ready to eat in minutes. Our periwinkles are picked in Kenmare bay at low tide during full and new moon phases.